Kendrick Kang-Joh Jeong, M.D., better known as Ken Jeong, was born on July 13, 1969 in Detroit, Michigan, the United States of America. Ken is a physician by profession, however, he rose to prominence as an actor and comedian. Ken’s most prominent roles have been landed in the series “The Hangover” trilogy and “Community”. Jeong has been active in the entertainment industry since 1997. So just how rich is Ken Jeong? Sources have estimated that Ken’s current net worth is $14 million. The most important source of his wealth is acting and it is expected that the net worth will be rising in the future, too. 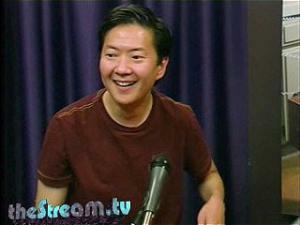 Ken Jeong’s father was a professor at North Carolina A&T State University in Greensboro. Ken graduated from Walter Hines Page High School winning Greensboro’s Youth of the Year Award for his superior achievements. Later, he graduated witha Bachelor degree from Duke University and a Master’s at the University of North Carolina at Chapel Hill. He became a professional physician while he was developing his abilities to perform as a stand up comedian. As with many other comedians. Jeong began his career appearing on the stage at various comedy clubs. In 1997, he debuted on television screens in the series “The Big Easy”. Afterwards, he episodically appeared in various television series such as “Cedric the Entertainer Presents” (2003), “Significant Others” (2004), “Two and a Half Men” (2005), “Three Strikes” (2006), “Curb Your Enthusiasm” (2007), “Worst Week” (2008), “Men of a Certain Age” (2009) and many others. In 2009, Ken gained the role in the main cast of the series “Community” (2009 – present) which made him famous and brought TV Guide Award for Favourite Ensemble and a nomination of Teen Choice Award for Choice TV: Male Breakout Star. Afterwards, he appeared in series including “Kung Fu Panda: Legends of Awesomeness” (2013), “Sullivan & Son” (2013 – 2014), “Hot in Cleveland” (2014) and others. In 2007, Ken Joeng debuted on the big screen in the film “Knocked Up” which was directed by Judd Apatow. The role of Leslie Chow in the film “The Hangover” (2009) directed and produced by Todd Phillips brought him MTV Movie Award and two nominations for Teen Choice and MTV Movie Awards. In 2011 and 2013 Ken appeared in the sequels of the film. He has also starred alongside Craig Robinson and Anna Kendrick in the film “Rapture-Palooza” (2013) directed by Paul Middleditch, and several other films. Currently, he is working on upcoming films “The Duff” directed by Ari Sandel, “Norm of the North” directed by Trevor Wall and “Ride Along 2” directed by Tim Story. Ken Jeong has also voiced-over several films including “Turbo” (2013), “Birds of Paradise” (2013), “Penguins of Madagascar” (2014) and others. Of course, Ken quit his job as a doctor and pursued a career as an actor as trying to keep up doing both was far too difficult. Ken Jeong is married to family physician Tran Ho. The family including twin daughters resides in Southern California. 3 [on his entrance in The Hangover (2009)] In the script, Chow had clothes on jumping out of the trunk, and I was thinking to myself the scene is screaming for Mr. Chow to jump out naked. I actually ran it by my wife, and she said, that's great, it'll be the feel-good movie of the summer because every dude will go home feeling good about themselves. 4 [on working as an MD during the day and doing improv at night]: I was the funniest doctor in America who was an Asian, under five-foot-nine and living in Los Angeles. 5 (2011, on director Todd Phillips) Todd gave me a career, and he's my favorite guy. He's family to me. We're bonded by our love of comedy and mayhem...I just trust everything about Todd Phillips, because all of my fame and success have been due to the first Hangover. 6 (2011, on getting involved in The Hangover Part II) I got an e-mail from Todd saying, "We'll be requiring your services," and then he gave me the script and I was crying laughing. The script, actually, was better than the first one because in the first movie, the script had actually existed before all of us, including Todd, had been attached. So this is the first script that utilizes our voices uniquely. Basically, you're building on the characters the audience has loved and also the characters we kind of formed in the first movie, so it was actually creatively easier for me as an actor this time around. All the hard work had been done in establishing these characters. 7 (2011, On the Hangover cast) I've known Zach (Galifianakis) for a decade, from doing stand-up. And I did a movie with Bradley (Cooper) prior to the first Hangover and a movie with Ed (Helms) prior to the first Hangover. So we're friends and we know each other, and on the second movie we got to be even better friends. Me and Ed went to Cambodia with his friends to go on a bicycle tour of Angkor Wat and the Buddhist temples there. I think people are always surprised to hear how mellow and close-knit we are. It's not like we're in character setting garbage fires in Bangkok in our off time! We're not crazy. 8 (2011) I remember I heard an interview on NPR where Terry Gross had asked Denzel Washington, "Do you look for roles that are role models for the community?" And he said, and this is Denzel Washington talking, the icon, "No! If I'm following what other people want me to do, I wouldn't be doing my job as an artist, as an actor. That would be so boring." I'm very inspired by that. I think about that a lot. 9 (2011, on landing his role in Transformers 3) Transformers 3 was really a recommendation from Todd Phillips, actually, to Michael Bay. Michael Bay had a role for me in mind and I met with him last spring. I play a co-worker of Shia LaBeouf and it was one of the greatest moments of my career because I saw how the big boys do it. This is sci-fi, this is action, this is fantasy, this is Steven Spielberg producing, and all my scenes were with Shia. And to work with CGI is the hardest form of acting ever, for me personally...I have to create that energy myself and then react off that energy. It's so much harder to do, so much harder mentally. That's why I have the highest respect for Shia, because he does that all the time. Three movies. Michael is a genius at finessing those reactions out and finessing that vision. 1 As of March 30, 2015, the Medical Board of California lists his medical license (65869) as "Renewed & Current" (meaning he meets requirements for the practice of medicine in California) until July 31, 2016. He is licensed to practice medicine under his birth name, Kendrick Kang-Joh Jeong. This means that despite his successful career as an actor in film and television, Jeong so far continues to maintain his ability to return to his first career as a medical doctor. 2 As of 4-11-13, the Medical Board of California lists his medical license (#A 65869) as "Renewed & Current" (meaning he meets requirements for the practice of medicine in California) until July 31, 2014. He is licensed to practice medicine under his birth name, Kendrick Kang-Joh Jeong. 3 Grew up in Greensboro, NC and graduated from Walter Hines Page High School in 1986. 4 Wife Tran is also a doctor. 5 Has twin daughters, Alexa and Zooey. The Hangover Part III 2013 performer: "Hurt", "I Believe I Can Fly"
The Goods: Live Hard, Sell Hard 2009 performer: "More Than Words"